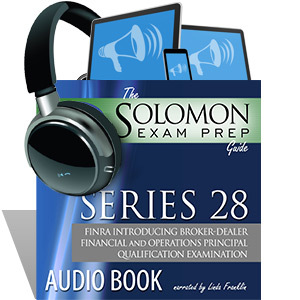 This 9.7-hour audio recording of The Solomon Exam Prep Guide to the Series 28 FINRA Introducing Broker-Dealer Financial and Operations Principal Qualification Examination will give you the content of this invaluable and enjoyable study guide in an audio format. After hearing the book’s well-written content, you will be even more prepared to tackle the Series 28 exam with confidence! The Series 28 audiobook is a great companion to the Series 28 Online Exam Simulator, the industry-leading online testing program that ensures you are learning and retaining the information. The support behind Solomon Exam Prep is like no other. I lean heavily on a few people there and they always come through for me every time! Passed my 6 last Friday. Heading into my 63. I highly recommend Solomon Exam Prep! Your study material laid a great foundation in my understanding of the tested material and was instrumental in my passing the Series 50.